The Jaguar C-X75 hypercar is only one of five prototype development and test hypercars in existence and reveals the future of luxury performance sports cars. The new Jaguar C-X75 hypercar will be looked at as the model for high performance luxury sports cars in the future. As global changes in performance engines and drivetrains evolve, the picture is getting clearer as to what the future of performance will look like. Jaguar is on the cutting edge of this new technology and it’s being revealed at the Goodwood Festival of Speed for the first time today. This hypercar reveals the future of high performance sports cars and it's exciting. 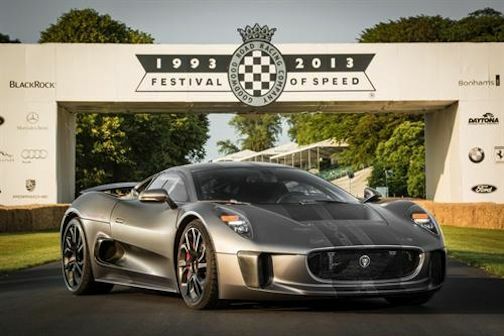 The supercar from Jaguar makes its public debut in the Michelin Supercar Run today at Goodwood. Jaguar is keeping the exclusive sports car under wraps and it will not be available on static display for any public viewing. This could be because of the highly sensitive technology that Jaguar doesn’t want getting into competitors hands. The C-X75 will make its way from its hidden enclosure to the hill in silent electric-mode before firing up its innovative 1.6-liter, supercharged and turbocharged four-cylinder engine on the start line. The state-of-the-art hybrid supercar generates a combined electric and gas-powered total in excess of 850 horsepower. It has a pure electric vehicle range of 60 km and has the ultra-efficiency of a low-emissions city car. But the C-X75 is a true performance sports car and will hit 100 mph from a standstill in less than six seconds and has a top speed of 220 mph. The 1.6-litre turbocharged and supercharged four-cylinder engine pumps out an amazing 502 bhp and is one of the world's highest specific power output powerplants at 313 bhp per liter. When you add in the 390 bhp from the two electric motors, it gets a combined output in excess of 850 bhp. The drivetrain puts all that horsepower to the pavement and transfers it to all four wheels. This will be one fast car on the track and in the corners. Jaguar has made the decision for now to not put the C-X75 into production. But the technology will see its way to future Jaguar/Land Rover vehicles. The Jaguar C-X75 showcases the British automakers world-leading expertise in lightweight vehicle construction and the company's innovative research into high-performance, low-emission powertrains. We are seeing the future of luxury performance supercars right before our eyes. Look for the technology from the C-X75 to filter down to production vehicles from Jaguar and Land Rover brands. Watch Jaguar C-X75: the development story-on track and in the workshop video.